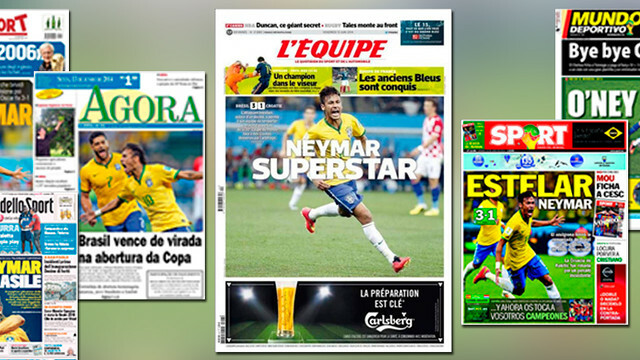 There were all kinds of reactions in the world’s press following Brazil’s 3-1 win over Croatia in the opening game of the 2014 World Cup. There was almost as much talk about some controversial decisions by Japanese referee Yuichi Nishimura as there was about the football, and not everybody was overly convinced by Brazil’s performance. But where there was unanimous agreement was that FC Barcelona’s Neymar stood head and shoulders above the rest and is already on course to being the star of the tournament. Brazil’s top sporting daily, O Globo, spoke of “a debut that neither Pele or Ronaldo had,” going on to explain how the greatest Brazilian footballer of all time, Pele, didn’t find the net until the quarter finals in his first World Cup, Sweden 1958, while Garrincha didn’t score at all that year. Romario was a disappointment at his debut World Cup in 1990, while the tournament’s all-time highest goalscorer, Ronaldo, also failed to find the net in his first appearance on the world’s greatest stage. But despite an injury scare in the warm-up, Neymar shrugged off the pressure of a hugely expectant home crowd to score twice in his first ever outing at a World Cup Finals. The biggest newspaper in the city staging the game, the Folha de Sao Paulo, was generally critical of how the home side had played (and like most Brazilian papers was willing to admit that they benefitted from an inexistent penalty), but it was gushing with praise for how Neymar, “o craque”, had led the team back into the game after a Marcelo own goal had put the Croats into an early lead. Catalonia’s other main sports paper, Sport, ran with the headline: “Neymar illuminates Brazil’s debut”, going on to explain how “the Barça striker always took the initiative for Brazil in attack and all of the main chances came from his boots”. Perhaps not surprisingly, the Croatian papers focused on other matters. “Croatia Robbed” was the headline in Novi List and Vecernji spoke of “Injustice”. But although it is impossible to deny that there was considerable indignation in the world’s press about some of the decisions that went in Brazil’s favour, there was no denying that Neymar was a class above the rest at the Arena Corinthians last night. He is already the name of everyone’s lips, and the World Cup has only just started.